Gelish MINI Watch Your Step, Sister! Miss me? I've missed you. So since my little Squish was born, I hadn't been wearing polish because time & I didn't want to mess with chipping & that's when it hit me... Hello, Gelish. Now, if you recall, I tried Gelish over 3 years ago and I hated it (read more here) but after careful trial and error, it's because I'm a dummy and didn't know you had to file off the top layer of gel before removal. Yeah, makes ALL the difference. That's kind of why gel tends to be professional only. Gelish actually is a professional product but the Gelish MINI bottles are sold at Sally Beauty Supply for everyone to try. Just be smart and read all the directions first. Also, I am obsessed with gel now because I bought The Painted Nail Steam Off system which literally steams your gel manicure off in 10 minutes or less. I will never soak again. So I randomly picked out of my box and came up with Watch Your Step, Sister! from the Cinderella collection that came out in February. I was a fan of the Morgan Taylor polish sister (read the review here) but I was shocked to see how BRIGHT the Gelish was! Here in the sun you can see it's a tab brighter than the Morgan Taylor polish sister. I'm still learning with gel and you can see a bit of tip wear and a little bit of VNL. Also, when I was applying, I was in a rush and tried to do my entire hand at once (instead of 4 fingers and the two thumbs separately) so I had pulling issues on both my pinkie (shown) and my thumb (which I'm hiding). Again, READ THE DIRECTIONS. I wore this manicure for almost an entire week before removing - after about 6 days, I tend to get a little pulling up at the cuticles from new growth which gets caught in my hair when showering. Gel is a great alternative for those who don't have the time (or energy) to keep up with regular polish. I go back to work tomorrow (and my Squish starts day care) so I'm going to see how I'm able to keep up with everything. ALSO I will be attending Cosmoprof North America next month for one day only so I will be trying to squeeze in all the important sights. Be sure to follow my Instagram for the latest. Gelish® MINI products are available exclusively at Sally Beauty Supply stores nationwide and online at sallybeauty.com. 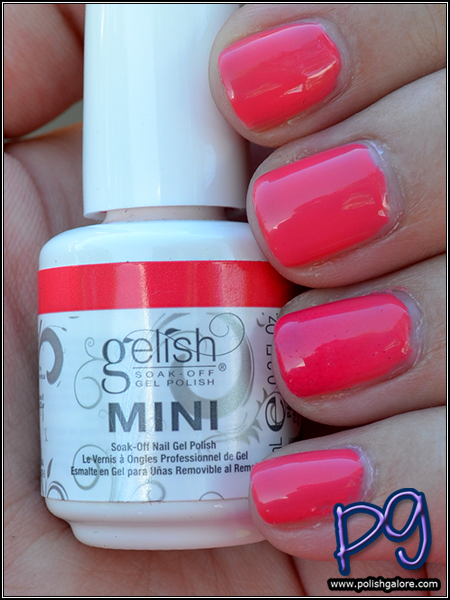 Follow Gelish® MINI on Facebook, Twitter, Tumblr and on Instagram (@GelishMINI). Gelish® MINI comes in an array of colors, applies like polish, with a twist cap and applicator, but are cured in an LED lamp for 30 seconds or in two minutes with a traditional UV lamps, just like gels. Gelish® MINI stays on the nail for up to three weeks of beautiful wear, with no chipping or peeling. 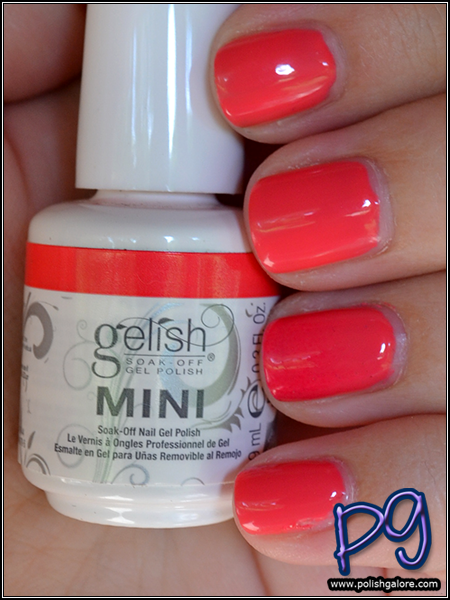 Gelish MINI® soaks off completely in only 15 minutes. For more information, please visit www.gelishminis.com.